At , residents have access to amazing amenities like , a , and a state-of-the-art . To top it all off, full-time , plans a year-round calendar of events and helps organize social groups based on residents’ interests. Check out some of the awesome groups and clubs that residents can be a part of! The Trailblazers Running Group meets for early morning runs together along ’s . It’s a great opportunity to get in shape or just to spend some time outdoors and get to know your neighbors better. This group is open to all ages and ability levels, so whether you want to train for an upcoming 5K, power walk while you chat with friends or get the whole family involved, you’ll grow to love mornings spent among neighbors and the trees. Tennis pros and beginners alike will love the Ladies Tennis Club! Each week, this club meets up on for social and exhibition matches. Learn a little from a more experienced player, practice your serve with a partner, or just get some exercise and fresh air while having fun with friends and neighbors. Proving that age is just a number, you don’t need to be 50+ to join this lifestyle group. Twice a week this group meets up at the to take advantage of the virtual fitness classes available on demand. With a focus on low-impact cardio exercises, this fitness group is perfect for anyone who needs adaptive exercises and craves a more social experience. Reel in the big ones with this group! Whether you enjoy fishing for sport or catch and release, the Kayak Fishing Club packs ton of fun into every one of their monthly meetings. 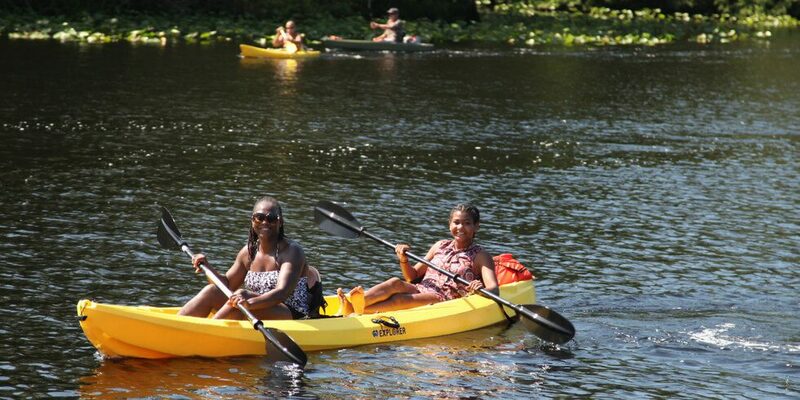 Members meet up at various launch areas throughout St. Johns County to paddle out to the local sweet spots. Relax on the water, practice your cast and get some pointers from more experienced fishermen. Members of the Strong Roots Moms Club believe that “strong roots create beautiful leaves,” and meet once a month with their toddlers in tow. This group does double duty, letting the kids play, socialize and make lifelong friends while mom gets some much-needed grownup time with friends of her own. Occasional themed meetings like ice cream socials make each month feel like a new adventure. Being a resident is more than just owning a home, it’s a community and a lifestyle. Interested in learning more about this unique community? Join our to always stay up-to-date on happenings.